Manhattan’s office market is closely watched by investors and businesses alike. Synergy Real Estate Group provides their thoughts on the market and what we can expect through 2011. 2010 was a come back year for Manhattan’s office space market following a dreadful 2009 that saw asking rents slide and vacancy rates spike as the economic crisis hit its peak. We’re now more than halfway through February and we want to share our observations and predictions for 2011. As a whole, the Manhattan office space market posted a positive net absorption over the course of the year meaning that more space was leased than was returned to the market. All of this occurred despite a shaky downtown market that is still trying to gain momentum and will likely remain stagnant through the first two to three quarters of 2011. 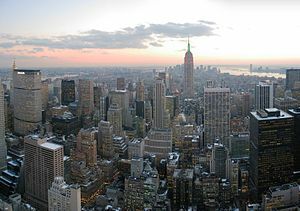 Manhattan is the largest office market in the United States and serves as a bellwether market for the rest of the country. It was decimated by the financial crisis as firms evaporated leaving behind a glut of space but now with improving employment numbers and institutional investment, the market is showing signs of renewed life. John Galaxidas, the CEO of Synergy Real Estate Group commented on the recent performance of the market. Galaxidas believes that the window for the best deals in Manhattan is beginning to close and that companies sitting on the fence about their commercial space need to get involved before its too late. For more information about office space in Manhattan, visit http://www.nycmanhattanofficespace.com to get rate and availability information for more than 30 neighborhoods.